We don’t get a whole lot of snow in east Tennessee. Maybe once or twice a year we’ll get a dusting. Well starting yesterday it actually did snow – pretty much all day. And today the snow continued, albeit light flurries. In the three years or so we’ve been here, this is the most snow we’ve seen! I know you cold weather people will laugh but we warm weather southern people get excited when it sticks to the ground. Schools are closed, people stick up on milk and bread, etc. It’s kinda cozy, so long as the electric stays on. 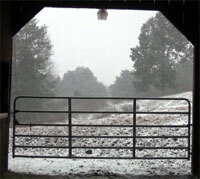 I went outside and took a short video of some snowy scenery around the barn and pasture. This is part 1 of 2. After I shot and edited this video, Mikki and I let the horses out today and got some great video of them playing in it. I’ll post that probably tomorrow. This is high definition video and it’s probably better seen in full screen mode. After you push play, there is a little icon in the bottom right corner of the video that will allow you to expand it to full screen. The video length is about 3 minutes and there is no music. Just snow falling, traffic in the background, the hum of the video recorder and occasional horsey sounds. EDIT: I almost forgot – making an appearance in this short video are our new barn kittens, Daisy and Clover! They’ve never seen snow before and don’t seem to like it a whole lot.